Mother’s Day is a celebration worldwide where we can show our appreciation to all mothers and mother-figures who have contributed a lot in our life. And there are many ways to celebrate Mother’s Day and it is up to you on how you will celebrate Mother’s in a way that all mothers and mother figures in your life will feel special. A lot of people may celebrate Mother’s day and show their love to their moms by cooking something special for their mom. 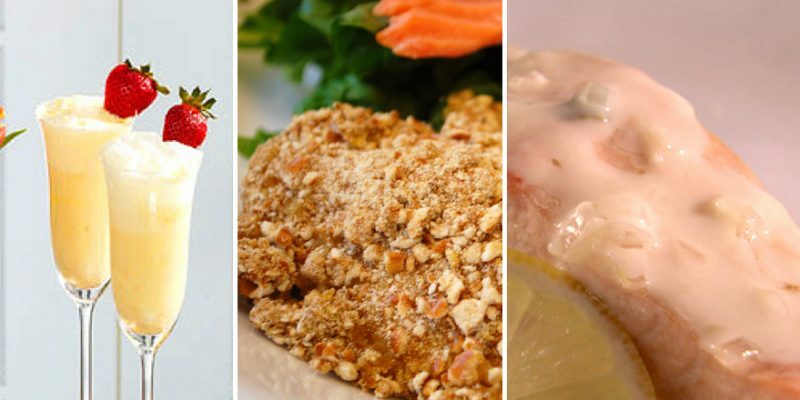 This year, to celebrate this special day of our moms, let’s take a look on some special Mother’s Day food recipes that are made even more special using wine as ingredients. Let your mom taste this “Grown up” creamsicle beverage. This Mother’s Day Recipe is a perfect way to give your mom a toast for all her hard work. Your ingredients include orange juice, cream, fine sugar, grated orange peel and a sparkling wine. In a blender, blend the orange juice, cream, fine sugar and grated orange peel. Transfer it in a container and freeze it for at least 6 hours. To serve, scoop mix and place it in a wine or champagne glass and top it with champagne. You can also garnish it with strawberry before you serve. If you are having a hard time finding a special dish to cook, don’t worry. Sometimes, it is the simplest and easiest dish to cook that has the boldest and most delicious flavor. Just like this mustard-baked chicken with a pretzel crust which you can prepare perfectly for Mother’s Day. You need hard pretzels, coarsely crushed, canola oil, whole grain mustard, Dijon mustard, water, red wine or red wine vinegar, salt and ground pepper and skinless, boneless chicken breast. Preheat the oven at 400 degrees. Pulse the pretzels and place it on a large shallow bowl. In a food processor, add oil the mustards, water, wine or vinegar and process them until smooth. Season it with salt and pepper to taste. Mix the dressing with the pretzel and add the chicken and coat. Transfer the chicken in a baking sheet and bake it for about 20 to 25 minutes. Slice the chicken and top it with the remaining dressing and serve. Prepare this dish for Mother’s day and enjoy a wonderful and luxurious dinner with your mom. Luxurious does not have to be complicated. You can complete this dish in as little as 45 minutes. Check if you have the complete ingredients. You need the following; zucchini , coarsely shredded, salt, extra-virgin olive oil, shallots (2 finely chopped and 1 halved), ground pepper, dry white wine, fresh corn kernels, lemon thyme sprigs, bay leaf, skinless salmon fillets, cold unsalted butter (cut into tablespoons) and thinly sliced basil leaves. Add the zucchini to the colander bowl and season with salt. Leave it for 20 minutes and squeeze the zucchini dry. In a skillet, heat the olive oil and add the chopped shallots and season it with salt and pepper. Cook until softened and add the wine and wait until evaporated. Mix in the corn and water. Cover and wait until the corn is tender. Add the zucchini and cook. Season with salt and pepper. In a saucepan, combine wine and thyme, bay leaf, halved shallot and water and wait to simmer. Season the salmon with salt and toss it in the saucepan and cook at a very low heat. After about 6 minutes, put the salmon in a plate. Discard the poaching liquid. Add the wine in a saucepan and simmer. Then add butter, 1 tablespoon at a time. Season with salt. Stir in the basil into the vegetables and place it on a plate. Nestle the salmon in to the vegetable and top it with the butter sauce. Serve. Add a taste of wine to your recipes and you can add more spice to the coming Mother’s Day. Get the most special wine for your recipes and show your mom how much you appreciate all her hard work and sacrifice by simply cooking for her.